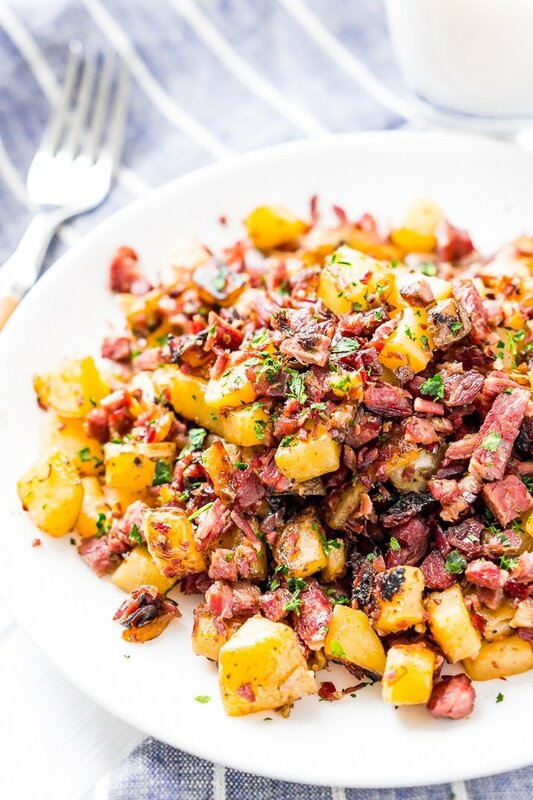 This Corned Beef Hash is a salty and delicious breakfast dish the whole family will love! 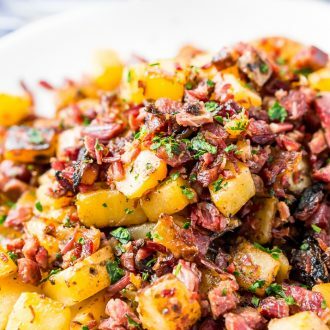 A simple hash made with brisket, potatoes, onions, butter, thyme, and pepper and a great way to use up leftover Corned Beef! How many of you grew up eating Corned Beef Hash as a kid? I did, but usually, it was a camping treat, we’d make it in a cast iron skillet over the campfire for breakfast. Back then, we always used the canned stuff, and you can definitely use it in this recipe too, but it’s pretty amazing when made with Homemade Corned Beef and the perfect way to use up leftovers from St. Patrick’s Day! 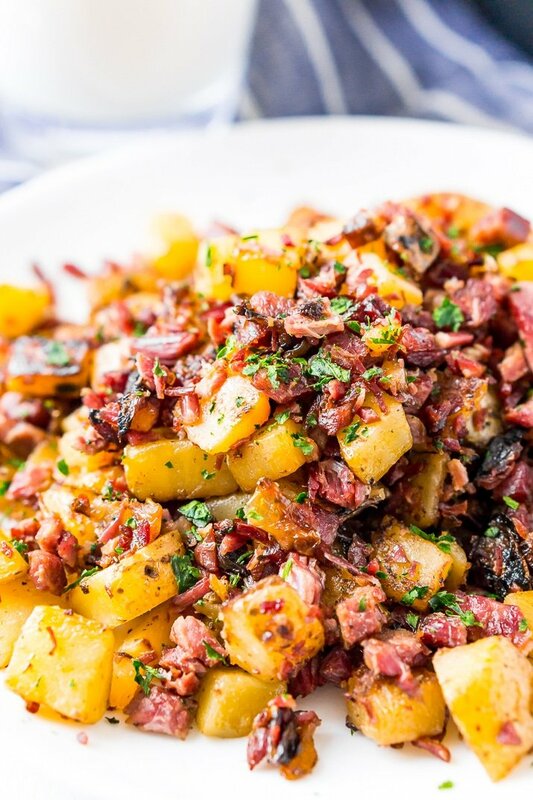 I absolutely love breakfast hashes, my Sweet Potato Hash is a favorite in our house, but I always look forward to this time of year when I get to indulge in some corned beef hash! 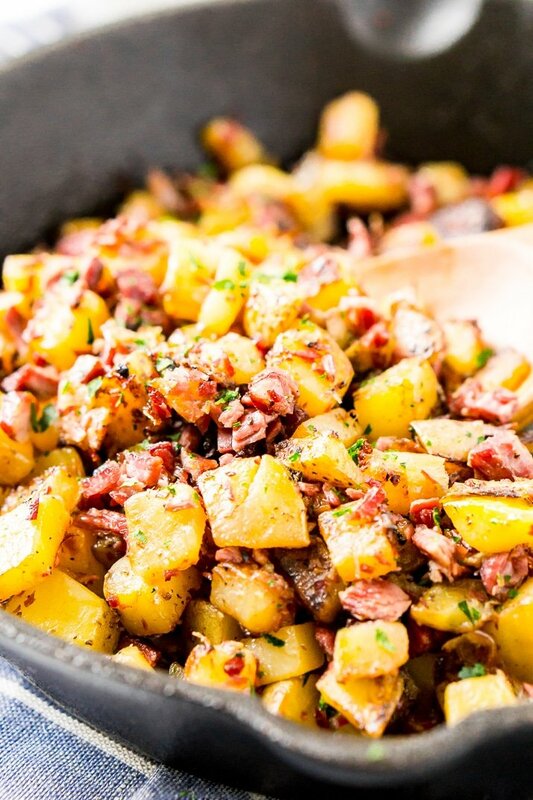 This hash recipe is made with super simple ingredients like onion, potatoes, butter, thyme, and pepper. It doesn’t need a whole lot of additional seasoning because the corned beef itself is so flavorful thanks to a lengthy brining process. But if you want to add even more flavor and texture to this dish, try serving it with a poached egg on top and let that creamy rich yolk soak into the hash, that’s the way my husband likes it, but I prefer it straight up! This breakfast recipe requires very little prep and is very easy to make. Begin by adding 2 tablespoons of butter to a large cast iron skillet and melt over medium heat. Then add the onions and cook until translucent, about 4 to 5 minutes. next, add the potatoes, thyme, and remaining butter and reduce the heat to medium-low and cook for 20 to 25 minutes until potatoes are tender. Stirring occasionally. Finally, add the corned beef and cook until heated through, about 5 more minutes, season with ground pepper as desired. If serving with eggs, prepare eggs during this time. Serve hot. 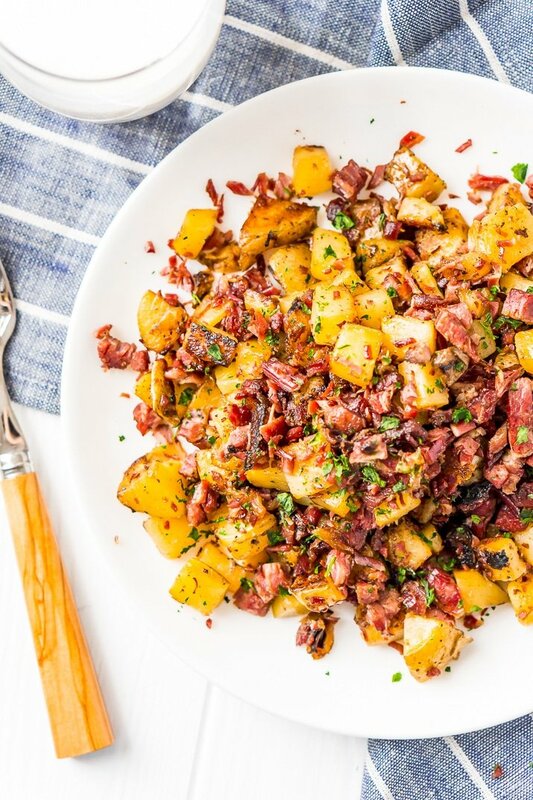 Pin this Breakfast Hash for Later! Add 2 tablespoons of butter to a large cast iron skillet and melt over medium heat. Add the onions and cook until translucent, about 4 to 5 minutes. Add the potatoes, thyme, and remaining butter and reduce the heat to medium-low and cook for 20 to 25 minutes until potatoes are tender. Stirring occasionally. Add the corned beef and cook until heated through, about 5 more minutes, season with ground pepper as desired. If serving with eggs, prepare eggs during this time. Serve hot. My husband would love it if I made him this corned beef hash. He even liked it from the can (gasp) but this is a HUGE step above that. Thanks for the recipe! Definitely not knocking on the can, it’s what we’ve all grown up with, but when you can make it from scratch, why not, right! Yes….I would eat this for brunch, lunch…and dinner. I remember corned beef in a can. OMG I don’t even remember the last time I had that. I prefer homemade corned beef too. PLUS….you need the leftovers to make this delicious meal. Yes, I prefer homemade too, especially for this recipe!